The dangerous women are coming to the Jean Cocteau this week. (We also hoped to present THE LAST SEDUCTION, but the film has been withdrawn from distribution because of a rights dispute, alas). See one, see two, see them all. Kickass avengers, femmes fatale, women warriors, alien queens, what more could you want? 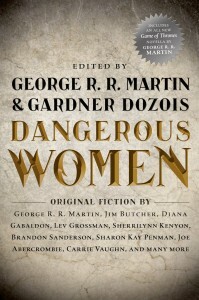 All of this, of course, is part of our Dangerous Women Week, to mark the debut of DANGEROUS WOMEN, the gigantic crossgenre anthology I edited with Gardner Dozois. And next Monday, December 9, we'll launch the book with "Dangerous Talk About Dangerous Women" at the Cocteau, a gala panel discussion and booksigning featuring me and Gardner, and seven of our contributing writers - CARRIE VAUGHN (! ), SAM SYKES (! ), MELINDA M. SNODGRASS (! ), S.M. STIRLING (! ), DIANA ROWLAND (! ), MEGAN LINDHOLM/ ROBIN HOBB (! ), and DIANA GABALDON (!). Well, I wouldn't say my desk is "durance vile," but I get your point. looking forward to all that you mentioned! Your Seven Kingdoms / Westeros material (anything in the mythos of Ice and Fire and Dunk and Egg) is nothing short of genius. I hope it's going well for you. Also, for those looking something to read until Winds; try out M.K. Hume's Merlin and Arthur books. Cornwell's were great so I'm looking forward to giving these a go.